They'll remember your kindness every time they reach for a cookie inside this cute ceramic cookie jar, clean and white with a high-gloss finish and vacuum-sealed bamboo lid. When it arrives with a dozen fresh cookies in time-tested flavors, this gift creates a charming addition to any kitchen! One Ceramic Cookie Jar with Engraved Bamboo Lid. Chocolate Chunk, Oatmeal Cranberry and Fudge Brownie Cookies. One line up to ten (10) characters. Enter information to be engraved during the checkout phase of the ordering process. if ordered by 2:30 am EDT Friday April 26th. Personalized Cookie Jar with One Dozen Cookies is a hand delivered gift. These gifts are delivered by one of our local design centers located throughout the United States and Canada. Same day delivery is available for most gifts when ordered before the cutoff time. The cutoff time for Personalized Cookie Jar with One Dozen Cookies is in the recipient's time zone. 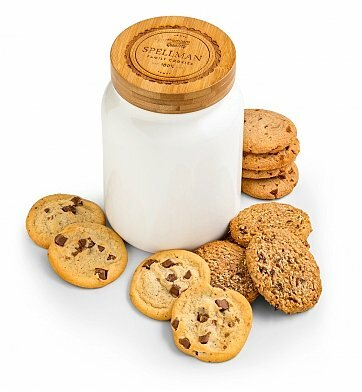 Express your sweet side with this personalized cookie jar filled with one dozen scrumptious cookies! Ceramic cookie jar with vacuum-sealed engraved bamboo lid. Includes free card with your personal message or greeting. was the response from my friend when she received this as a housewarming gift! Guess I made a great choice! Wonderful tasting cookies and the personalized cookie jar outstanding! I have not seen this, but the family that I sent it to called to tell me that it was great and the cookies were great. They were over the moon happy with this gift. I feel good about this product and would order it again. Like the selection of unique gifts. Cookie jar and fortune cookie turned out great. Thanks! This beautiful cookie jar was sent to a client as a birthday gift. The client loved the personalized jar and said the cookies were absolutely delicious!